Rising star Ayanna Pressley calls Alexandria Ocasio-Cortez her "sister in change," but this race isn't an ideological battle. CAMBRIDGE, Mass. — Blink and you might miss her. 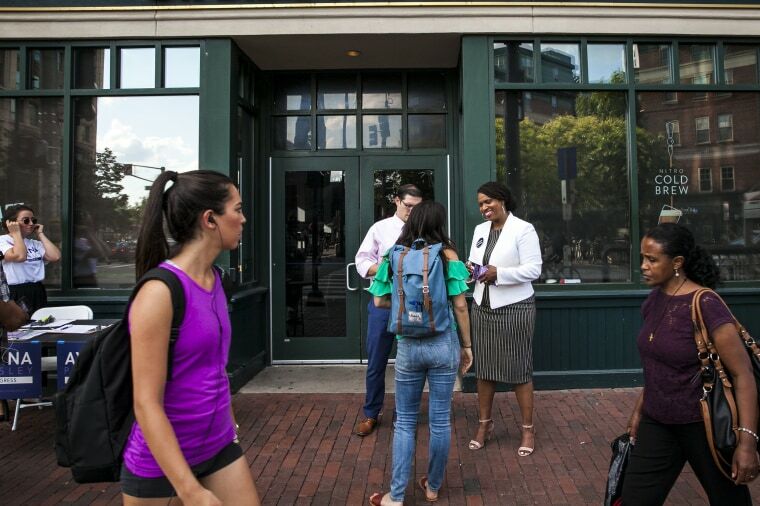 The woman who could be the next progressive superstar was standing by a small folding table outside a busy T stop in Central Square as commuters streamed by one evening last week. In a deep blue congressional district once represented by John F. Kennedy and legendary House Speaker Tip O'Neill, Ayanna Pressley is trying to topple a 22-year incumbent in the next big test for insurgent Democrats. "I knew that I would be out-endorsed, I knew that I would be out-fundraised and out-spent, and now the challenge is on me to out-organize," said Pressley, who in 2009 became the first woman of color elected to Boston's City Council, 379 years after its founding. "This is a fight for the soul of our party." Those who did stop seemed engaged. Black women came to hug her and say how inspiring it was to see someone who looks like them in power. Millennials pulled out their earbuds to pose for selfies. And MJ Jensen, with grey hair and plastic-rimmed glasses, joked that while some of her best sons are men, "It's time to let us screw stuff up for a change." Women have been winning Democratic primaries at astounding rates this year, while insurgents have had a worse record. Pressley, a rising star before this race, may represent the last best chance to repeat the success of Alexandria Ocasio-Cortez, the progressive phenom who ousted a powerful Democratic congressman in New York City. Pressley calls Ocasio-Cortez "my fellow sister in change," and Ocasio-Cortez likes to quote Pressley's line that "the people closest to the pain should be closest to power." On the night she won her primary, Ocasio-Cortez encouraged followers to vote for Presslsey. But Pressley, a former Hillary Clinton surrogate whose political talent has been recognized by national Democrats for years, is not Ocasio-Cortez. And Rep. Mike Capuano, D-Mass., who has an impeccable progressive record and took the primary threat seriously from the beginning, is not Rep. Joe Crowley D-N.Y.
Rather than ideology, the Sept. 4 primary may be more a test of Democrats' desire for fresh leadership, and especially from women and people of color, in one of the few majority-minority districts in the country represented by a white man. Capuano, who calls himself "a street pol," or local politician, will never be accused of 'going Washington.' But his parochial style of politics may no longer cut it for critics who say he, after two decades, has not adequately used the safety of this deep blue seat to advance the progressive cause. A recent WBUR poll had Capuano shy of 50 percent — uncomfortable territory for an incumbent — while more than one-in-five voters remain undecided. But with the same poll showing Pressley down 13 percentage points, it's clear she needs to get millennials and people of color, who don't typically vote in midterm primaries, to tune in and turn out for an election scheduled for the day after Labor Day. "There's plenty of time for things to change significantly," said Steve Koczela, the president of MassINC Polling, which conducted the survey. "The question for the Pressley campaign is whether they can expand the turnout." As Pressley sweated in the August heat, Capuano was less than two miles away in an air conditioned hotel ballroom to meet unionized carpenters, who munched on pizza in their workbooks as local officials bragged about the money Capuano brought back to the district. "There is no greater progressive and no harder worker than Mike Capuano in all of Washington," said Joseph Curtatone, who succeeded Capuano as the mayor of Somerville, a historically blue-collar city just north of Boston. Capuano has rarely faced a primary since he was first elected in 1998. But when Pressley got in the race, he canceled a vacation and got to work. "I have a lot of friends and they all said, don't worry, you're going to be OK," Capuano said in an interview. "It took me a while to get people to realize this is a serious campaign." In Capuano, who looks a bit like a bespeckled James Gandolfini and sounds a bit like a Kennedy, many see a devoted public servant, fanatical about constituent services, with perfect ratings from groups like Planned Parenthood and the ACLU. He voted against the Iraq War and the Patriot Act, was into sanctuary cities and Medicare for All years before they were cool, and has voted to impeach President Donald Trump. In other words, as John Walsh, the former chairman of the Massachusetts Democratic Party put it, the pro-Capuano argument is "if it ain't broke, don't fix it." But Walsh is supporting Pressley because he believes it is, in fact, broke. "When the choice is between someone who knows how Washington works and someone who would change how Washington works, I think the choice is pretty easy," he said. "To me, if I can get the same votes from both, then I ask, well what else?" The state's attorney general, Maura Healey, a rising star in her own right, made waves when she endorsed Pressley two weeks ago. And both of the state's Democratic senators, including Elizabeth Warren, have conspicuously decided not to support their fellow member of the congressional delegation, but instead remain neutral in the contest. Warren said she likes both candidates, echoing the sentiment of almost every major Democratic politician in the state, even when they've taken a side. "Everything about his challenger and her campaign makes me proud," former Massachusetts governor Deval Patrick said while endorsing Capuano. "But Mike was with me in the trenches, and I appreciate how hard he worked with me in tough times and out of public view for the good of the people of the commonwealth." Both candidates agree there's not much daylight between them on policy. "We will vote the same way, but we will lead differently," Pressley said in a debate last week. Capuano agreed: "The votes on the floor of the House are going to be, for the most part, the same," he said. But both also say there's a lot more to being a member of Congress than voting — and each make that case in a very different ways. For Capuano, it's about the clout he's acquired in Washington and his ability to use it to deliver for the district. "Those are the kinds of things that do take time to learn how to do," he said in the debate, before name checking a train station he helped fund. "And right now, at this time, I think this is what this district needs: somebody who knows how to get things done and fight Donald Trump's agenda." Pressley talks a lot about transportation too, like in a new video released by her campaign that recalls Ocasio-Cortez's viral Subway clip. The video shows Pressley on her commute on the No. 1 bus from Cambridge to Roxbury, which she says can tell you everything you need to know about the district. "The lens that I bring is certainly informed by my own life experiences and hardships," says Pressley, who has spoken about surviving sexual assault and being raised by a single mother because her father was incarcerated. "But more than anything, it's a lens informed by the people that I listen to every day," she continues. "I have stayed, on purpose, in close proximity to the hurt, acutely uncomfortable, so that I'll never grow complacent in tackling these inequities." The highly diverse 7th Congressional District, which forms a crescent around downtown Boston, encompasses some of the wealthiest and poorest zipcodes in the area. It includes booming biotech companies and prestigious universities in Cambridge; historically black neighborhoods in Boston; working class white districts made famous by Ben Affleck films; and the wealthy Southern suburb of Milton, birthplace of George H. W. Bush. But where Ocasio-Cortez seemingly came out of nowhere, Pressley has been paying her dues and attracting national recognition for years. She spent 16 years as a staffer for some of the biggest names in Massachusetts politics, including John Kerry and Joseph Kennedy II, who used to represent what is now the 7th District in Congress. Barbara Lee, the prominent philanthropist and women's advocate, who is based in Cambridge, says she was the first person to ever ask Pressley to run for office. "I've been working to elect women for 20 years, and I know talent when I see it," Lee said in an email. "She has a gift." Pressley's election to the Boston City Council in 2009 made her a sought-after national surrogate. And in 2015, EMILY's List selected her for their Rising Star Award, which is given to one female politician a year. The influential Democratic women's group told Pressley this time that it couldn't endorse against a pro-abortion rights incumbent. But one of the group's staffers moved to Massachusetts to be Pressley's finance director and Stephanie Schriock, the EMILY's List president, has raved about her. "I personally have been extremely impressed by her passion, commitment, and perseverance," Schriock said in an email. Will all that be enough to compel people to go to the polls, the day after Labor Day, especially when the incumbent is acceptable to almost everyone? "I'm doing what Democrats said we needed to coming out of 2016, after that sobering defeat, which is to build a bench, to usher fresh faces and new voices and new ideas," Pressley said. "This is bigger than this election cycle."